The Honour Roll commemorates those from the Shire of South Barwon who served in World War One. 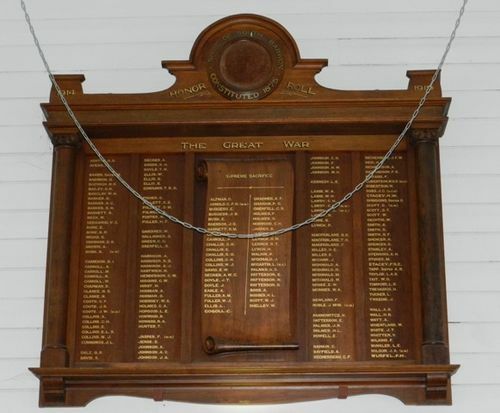 The magnificent honor board containing the names of all soldiers in the shire of South Barwon who enlisted for service in the A.I.F., will be unveiled at the shire hall, Belmont tomorrow afternoon. A thanksgiving service will he held. Residents particularly soldiers from all the shire are cordially invited to attend. After the service, the honor board with machine-gun will be unveiled in the council chamber. Only soldiers, relatives of soldiers, and those having invitation cards can witness the unveiling ceremony, but after that the public can inspect the board. Limitation of the number of invitations for the unveiling ceremony was due to the fact that the council chamber cannot hold a big crowd. Geelong Advertiser (Vic. ), 5 November 1921.